available for my products, on request. Slide On ID tags (tags are purchased elsewhere by customer). I often add slide on type ID tags to the padded collars – these thread on to the webbing collar (in the making process) and the padding goes all behind them, to protect the neck completely. There are lots of companies who sell these – I will add them to a collar I’m making for you, for free, but you need to order the tags and have them sent to me BEFORE I make the collar for you – make sure you CHECK with me first (or see below) as to what width and specifications of tag you need for the collar you want it on. I can email you some companies that make these ID tags. - also, some I.D. tag companies specify THICKNESS of the webbing that the tags fit, if you need to know this, then the plastic quick release buckle collars are single thickness webbing, and the buckle/eyelet collars are double thickness. You can post the tags to me (or have them sent direct by the company) – and don’t forget to tell me you are doing this before I make your order! On request I can use strong plastic D rings on my quick release collars, instead of metal – available for narrow, medium and wide width collars. I can also add extra D rings on request, leave them off a collar, or put a larger D rings on a smaller collar for you…. 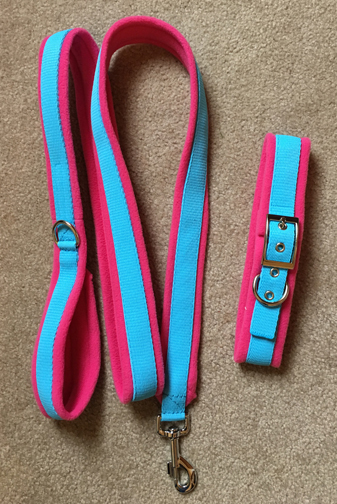 Leashes – I can make any length for you, and variations as needed. 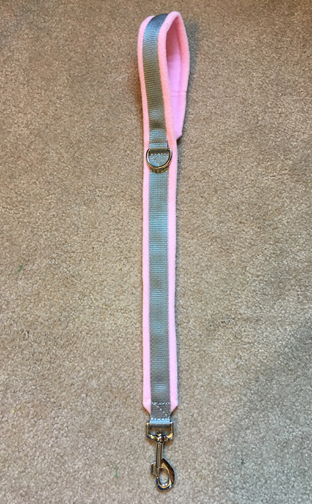 Email me to discuss the length of leash you want (in 3 widths) & for a quote – padded handle / plain webbing only/ fully padded / or options with a pattern….. also available are 2 ended (TTouch leashes), harness / handle only leashes, double leashes, single or double seatbelt restraints…..
left (top): double seatbelt tether special clip, left (below): fully padded 2 ended (TTouch) leash, centre: double leash, 2 harness /very short leashes, right: 2 seatbelt tether. Bottom: fully padded 6ft leash with D ring at base of handle / 24″ fully padded harness leash.